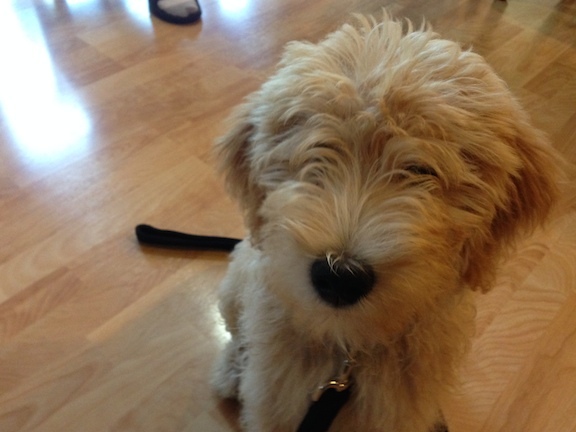 This is Bruce, a precocious three month old Labradoodle puppy. Bruce’s owners called me for help with his rambunctious behavior; specifically his refusal to respond or follow commands or corrections, nipping or biting to protest being corrected along with rough play. When his owner’s messaged me on Facebook, they told me that they lovingly referred to him as sharknado, which made me laugh. However she also informed me that if I wasn’t able to help them put an end to these problems that they would likely have to rehome Bruce as he recently bit and refused to let go of the families preteen daughter when she attempted to pick up a ball that was near him. When I arrived for the session, Bruce was out in the backyard and he ignored his owners when they tried to call him in. His owners used a number of different calls and methods to get him to come. Bruce clearly heard but ignored them, so I suggested that they stop and that we all go inside. Sometimes dogs are smart enough to discover that they can get more attention from their owners by ignoring or defying them. This was clearly the case with Bruce. The bottom line is the more that his owner’s called and encourage him, the more they put him into the drivers seat or position of authority as he was calling the shots. I suggested closing the door and leaving him outside alone for five minutes before calling him again. This is more effective that repeatedly calling a dog who isn’t responding. Once Bruce was inside, he displayed typical puppy behavior. He ran around like crazy, jumped up and barked for attention, ran away anytime he was corrected and basically did whatever he felt like doing. I pulled out a leash and attached it to his collar, then stepped on it about 14 inches away from his head. It gave him just enough room to stand or sit next to me without any tension on the leash, but not room to do anything else. At first Bruce pulled with all of his might before he started yapping in protest. I ignored him and after a moment he settled down a little bit. A minute later he sat down and a moment after that, he laid down on the floor and was completely calm. I suggested that they repeat this technique anytime Bruce gets defiant or gets too excited to control himself. This is a great way to disagree with unwanted behaviors provided it is applied consistently as soon as the dog start to engage in the unwanted behavior. Next, I went over some basic communication methods and suggested a few rules for them to incorporate to help change the leader follower dynamic in Bruce’s eyes. Unlike most of my client’s, Bruce’s owner’s had incorporated a few rules and boundaries which is a great start. I suggested a few others such as expecting him to sit down before letting him in or out of the door and changing the feeding ritual so that Bruce knows he must wait for permission to eat the food that is already inside his bowl. Next I showed the members of his family an exercise that will help Bruce learn to focus, look at humans as authority figures and most importantly practice impulse control. It only took a few repetitions before he understood the rules of the exercise. Once he did, I walked the members of the family through it as well. By the end of the appointment, Bruce was calm, responsive to commands and even obeyed when corrected. His family will likely experience a few hiccups from Bruce as he is a young pup. By consistently giving him the leash time-out and practicing the leadership exercises, Bruce will learn that good behavior is rewarded and unwanted behaviors are not.